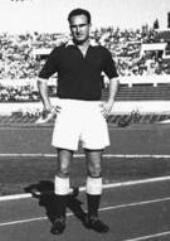 John Angelo Valdemar Østergaard Hansen ( July 24, 1924- January 12, 1990 ) was a Danish footballer who played profesionally fos seven years in Italy, and famous with his career with Juventus. Born in Frederiksberg, Hansen starting career with Copenhagen club BK Frem with whom he won the 1944 Danish Championship. He play as left inside forward, and was a world-class header of the ball. He was the top goal-scorer of the 1948 Danish Championship. Hansen made his debut for Danish national team in June 1948. He was not well known outside Scandinavia until he played at the 1948 Summer Olympics in London, which made him top scorer in this tournament. Hansen is a world-class header and prolific goal scorer also had powerfull shooting. Though he wasn't fast, he was smart at the moment of getting unmarked and losing opposing defender, and had incredible feeling for being at the right spot on the right moment. This set needs and update too. Too high passing speeds values for a selfish striker. the same for RES and AGI. The ability to be in the right place to score is called Positioning (S.A.) or can be represent with Attack (I suggest 94) no with response (I suggest max 85).